It's no secret that the Verizon Palm Pre Plus and Palm Pixi Plus will be able to use a special Mobile Hotspot application. The application will essentially turn the phone into a MiFi, supporting connections from up to 5 wi-fi devices at once. Wouldn't it be great to have that on non-Verizon device? With a little homebrewed love, it's possible, but honestly at this stage we recommend the vast majority of users wait on the sidelines to see how things shake out. User reports seem to indicate the Mobile Hotspot application was available on the App Catalog for a short amount of time before disappearing. Evidently it was up for enough time for people to grab the ipk file and dissect it. Called com.palm.app.mobilehotspotupdatepre_1.0.3_all.ipk, it isn't the Mobile Hotspot app itself, but instead is an installer. Launching it will install 2 ipk files to device's root partition as well as an ipk file called com.palm.app.mobilehotspot_1.0.3_all.ipk. That's the one folks in the Moble Hot Spot For Sprint thread say you should use. However, simply installing the Mobile Hotspot app isn't enough for to get things running. You'll need a little homebrew app called freeTether. For those who don't know, freeTether is an in-development (but very stable) free tethering app from the folks at WebOS-Internals which installs safely and operates effectively. However, since it's still in the testing feed, it's not yet downloadable in Preware. For now, you can download freeTether app from here and the freeTetherD Linux daemon here: Pre, Pixi, emulator. The rest is pretty simple. 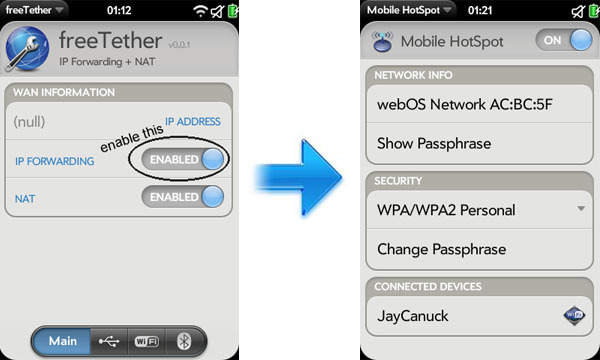 Whenever you want to use Mobile Hotspot, go into freeTether first and switch IP Forwarding to enabled. Mobile Hotspot will then work fine. When you're done with using Mobile Hotspot, it's just as simple: turn it off and go into freeTether to disable the IP Forwarding. It's still quite exciting to see the Mobile Hotspot app getting a larger audience than just Verizon, especially give how much quality Palm put into it. The legalities and costs of putting that software on a Sprint device and tethering with your phone without the proper plan are, well, let's just call them "less than clear." In other words, it's probably best to at least wait until freeTether gets fully baked rather than try to hunt down the less-than-freely-available Mobile Hotspot ipk. Otherwise, when your next Sprint bill comes, don't say we didn't warn you. Update: There's now a patch available that you can use instead of freeTether (though freeTetherD is still needed) which will automatically set IP forwarding for you. Thanks to jp22382 for the tip!